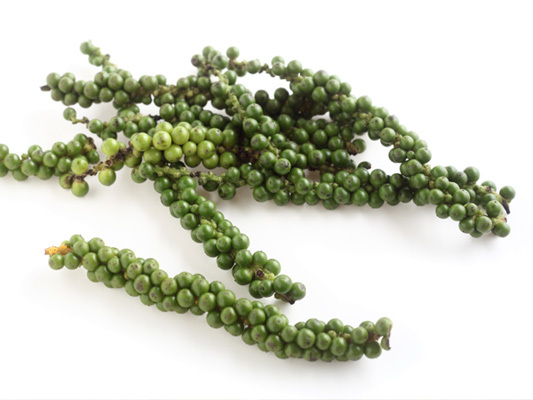 This is what black pepper looks like just after it’s harvested. Who knew? There is the gradeschool myth that Far East spices, including pepper, were used to cover the taste of rotting meat. But recent scholarship suggests that if a family could afford spices from the Far East, they could also afford freshly slaughtered meat–which logically, makes sense. However, the old legend may not have been entirely wrong, just misinterpreted. A 1998 study by Cornell showed that black pepper, as well as many other spices, have antimicrobial qualities. Ground white and black pepper kill up 25% of bacteria they come in contact with, although pepper doesn’t hold a candle to garlic, onion, allspice and oregano, which kill 100% of bacteria. So, perhaps meats of the Middle Ages weren’t highly spiced to hide the flavor of rotten meat, but to actually stop the meat from rotting. Pepper, therefore, acts as a preservative by keeping microorganisms at bay. Early Americans seemed to be aware of pepper’s preservative properties. There’s a bizarre story recounted in the 1949 book Pepper and Pirates of a seafaring man who died far from home in the early 19th century, and he “was shipped back to Salem in a coffin filled with pepper.” Apparently, his body made it back little worse for the wear. Another way that the myth of covering bad tastes with spice is corrected is to point out that spices were MUCH too expensive to waste on something that was rotting. They were a luxury product for use with only the best of local meats and produce. Yes! It only makes sense.